Learn to Fly Airplanes in New Jersey. Airplane Flight Instruction from Philadelphia, to Atlantic City, to Cape May. How do I get a pilots license? Decide what you want to fly. FAA's rules for getting a pilot's license (certificate) differ depending on the type of aircraft you fly. You can choose among airplanes, gyro planes, helicopters, gliders, balloons, or airships. If you are interested in flying ultralight vehicles, you don't need a pilot's license. You should also think about what type of flying you want to do. There are several different types of pilot's licenses, from student pilot all the way up to airline transport pilot. If you are serious about wanting to learn I can get you there, please read on. Cost of flight lessons ? To obtain your Private Pilot Certificate you will need to train with a FAA Certified flight instructor. You may use your own plane or rent one from a local flight school in your area. The chart below depicts the average cost. In a perfect world, 40 hours is what the FAA requires, so you can take your flight test, but since we do not live in a perfect world, the national average is about 65 hours. The most common elements that affect the increase of hours is weather, and gaps in training (plane not available, student or instructor unavailable). 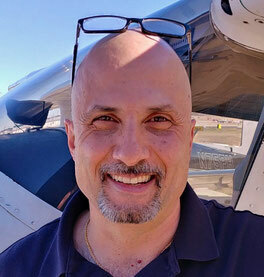 My name is Lou DiVentura and I am a FAA Certified Airplane Flight Instructor based in New Jersey at the Atlantic City Airport. I received my private pilot license in 1989 at the Flying W Airport in Medford, NJ, since then I have attained my instrument rating, commercial certificate, seaplane rating, tail wheel endorsement, complex endorsement, high performance endorsement, and flight instructor certificate for single engine airplanes. I currently reside in Linwood, NJ and I am an active member of AOPA and NAFI. I can provide for you detailed airplane flight instruction so that you become a safe and proficient Private or Commercial pilot. If you need to transition to a complex airplane, I can tailor a thorough program to ease you into the transition. The FAA mandates that all pilots maintain proficiency through a Flight Review CFR 61.56. I will provide for you the needed 1 hour of ground training and 1 hour of airplane flight instruction at the Atlantic City Airport. The Flight Review will include current general operating and flight rules of CFR part 91. As a FAA certified airplane flight instructor my philosophy is quite simple. I will train my students so that they will be familiar with the new Airmans Certification Standards mandated by the FAA. During our flight lessons, I will help my students learn by providing for them a training syllabus tailored to their specific needs. I will emphasize the positives of flying by providing my students with a safe and comfortable environment on the ground and in the air. I will minimize my students frustrations by being there for them during training. Since I am a life long instructor, and training is expensive, I will provide adequate airplane flight instruction and flight reviews.